Events are a valuable marketing tool because they assist businesses to maintain and grow relationships with existing customers, but more importantly, they provide businesses with an opportunity to reach a captive audience and pursue new business opportunities - providing you invite the right prospective clients of course! 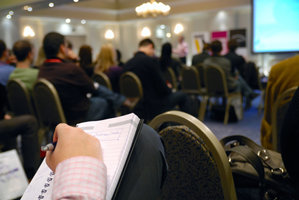 Event Attendance - How do you Increase the Number of Quality Attendees? Business Advantage has particular expertise in organising events for senior decision makers of CAD/CAM/PLM and related operations in any country throughout the world. We can work with data supplied by you, or target precisely from our own databases or source new prospects for you. For those targeting the UK market, our UK CAD/CAM User Site Database of 35,000 decision makers from 15,000 CAD/CAM using sites is a highly cost effective tool for precision targeting. No matter where your event is, our expert telemarketers can ensure the attendance of the right people in the right numbers. We can take the hassle out of the process and enable you to focus on your core competencies. Don't just 'play-it safe' by inviting those familiar friendly faces whom you already know, take a risk, invite highly targeted prospects who will make you and your team work harder and achieve better business results.